There is often the talk of greening the complete outer surface (four walls and the roof) of a building and provide it with a “green shroud“. This was done in Eupen, situated just over the border into Belgium, where the new Parliament building of the German Speaking Community is situated. The project was implemented in an exemplary manner over 635 square meters of roof and walls greening. Modern architecture combined with advanced building greening concepts have created an impressive estate inserted between the historic main building and the park. Since October last year, the Parliament of the German Speaking Community of Belgium has taken up its new domicile in Eupen. The administration as well as the faction offices have taken over the renovated premises of the former Sanatorium situated on the Kehrweg. This historical building was constructed during the reign of the Kaiser in the first half of the 20th century and had, due to the past political situation, both German and Belgian owners and therefore different roles. The building and its surroundings became the property of the German Speaking Community. But as it was lacking representative rooms, during the reconstruction and renovation phases of the former Sanatorium (autumn 2008) an international architects' competition was held. This competition was won by Atelier Kempe Thill of Rotterdam and their partners Artau scrl d’architectures, Malmedy. A very special eye catcher is the complete greening of the new Petition Hall. Due to the fact that the older main building situated in the background is clearly higher than the newly built Petition Hall and constructed on a slope, the entire roof of the new hall can be admired from above. For this reason the planners decided to green all the outer surfaces i.e. roof and walls of the new hall uniformly. As a consequence the new hall was integrated impressively with the restored Sanatorium and the surrounding park. The architects talk about “a scenic object in front of a manor house where both buildings attain their own character but nevertheless conform an architectonic unit“. There is a lovely view of the park both from the main building and the new hall. The new Assembly Hall is a concrete building covered with a sprayed-on heat insulation layer of polyurethane foam 160 mm thick. The roof has a layer of root-proof PVC sealing and thus prepared for greening. The architects' goal was to achieve a uniform appearance of the roof and walls and to obtain a perfect blend between both. So they searched for a provider that could offer systems, experience and planning capacity for roof and wall greenings. Optigrün international AG, the global player from Kitchenwares in Baden-Württemberg complied with the planners' expectations. Architects, Application Engineers from the Optigreen head office as well as Belgian regional authorities analyzed several possibilities and finally opted for the Optigreen System Solutions “Wall Garden” and “Lightweight Roof” that complement each other perfectly. As it was desired to have greenings exclusively with Sedum species with preferably red leaves, pre-cultivated Sedum vegetation mats were employed. The roof surface was herewith immediately covered and greened. Even the chamber that is required for inspection was greened, so that the roof presented a uniform greened look. On first sight the transition from roof to wall greening appears seamless because the material and colour used for the perforated metal plate that extends over the roof greening are identical to the ones used for the wall garden elements. Given the size of the perforations in the plate the Sedum plants can grow through them and cover the plate completely. The Optigreen Wall Garden is a greening system intended for vertical walls, has no contact with the ground and is based on substrates. It has many advantages: plants have better resistance to frost, there is more water retention as well as moisture buffering and more room for the roots. The standard dimensions of an aluminium wall garden element are 600 x 1000 mm, but of course these elements can be made to order so that design specifications can be complied with. Customized designs may be attained as a result of the various colours and substrates which are available. 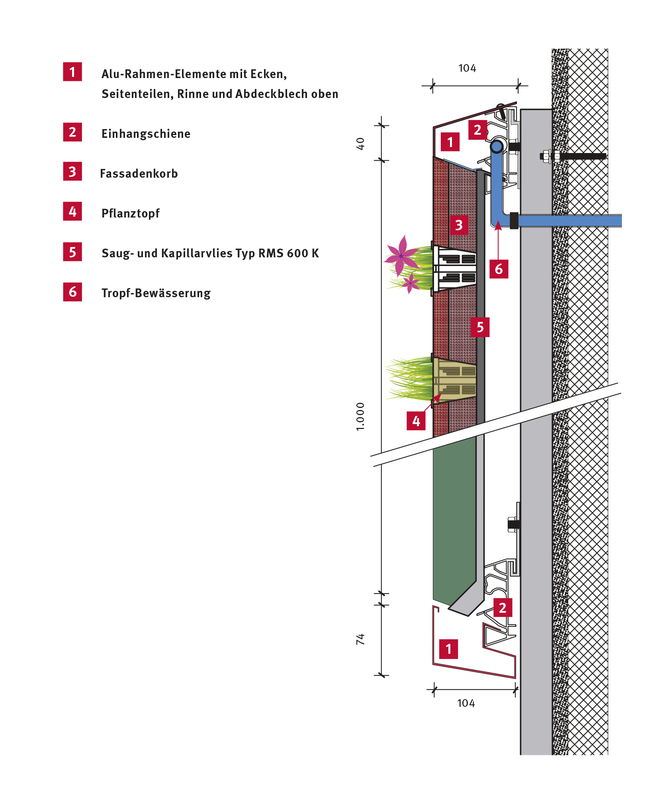 The structural requirement for installing the Optigreen System Solution “Wall Garden“ is a statically adequate wall (with or without heat insulation), which can take an additional load of at least 120 kg/m². Onto this wall you will mount and align the Optigreen Suspension Rails. For this purpose only approved fastening elements should be used. These rails can be mounted directly onto the wall as long as this is feasible. If this is not the case then Bearing Rails should be used, and onto these the Optigreen Suspension Rails can be fixed. At the Eupen project Optigreen Suspension Rails were fastened to a Contrial substructure. The wall garden elements can be greened later, when they are hanging from the rails or in this case pre-cultivated. This means that they can be installed totally greened. In the Eupen project the wall elements were pre-cultivated and Sedum plants were planted into pots. Sedum sprouts were incorporated into the substrate several months before the construction began. As a result an extensive Sedum greening existed during the installation phase in November 2013. Wall Gardens must be tended regularly. Tending of wall gardens consists of pruning and replacing individual plants when necessary, as well as taking care of water and nutrients. Tending frequency depends on the type of plants used, the seasons and the consequent plant growth. A permanent supply of water and necessary nutrients are decisive. Optigreen offers an irrigation system with an integrated nutrient supply. For this purpose the client must plan an adequate supply of water and electricity. In order to maintain drinking water consumption as low as possible recirculation systems controlled by computed have proved very useful. This means that sensors measure the moisture in the substrate and enable/disable a drip irrigation system when necessary. 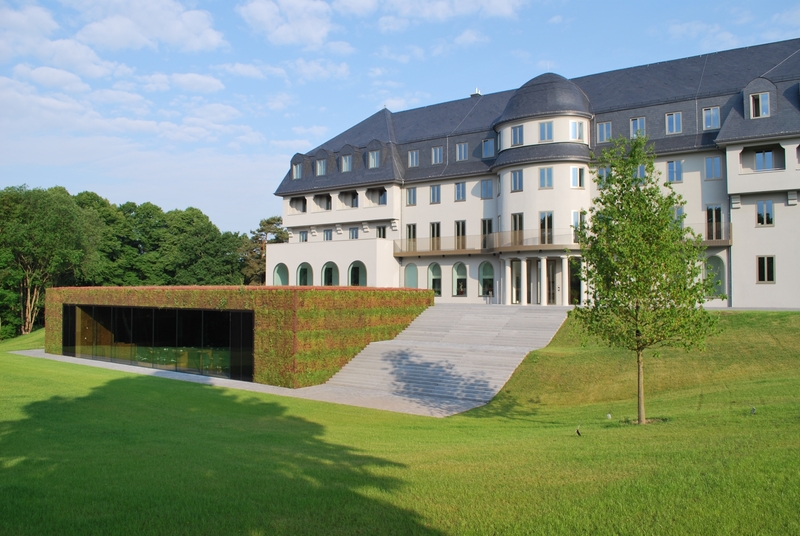 In the Eupen project each wall is controlled individually and each row of the wall garden has an irrigation hose approximately every 1160 mm. Each wall has been equipped with four temperature and moisture sensors for regulation and remote control. The dream of every urban ecologist was implemented in Eupen – i.e.the complete greening of a building, where roof and wall greenings blend into each other. In the new building of the Parliament of the German Speaking Community the roof and all walls were greened, creating an impressive eye-catcher. As soon as the Optigreen System Solutions “Wall Garden“ and “Lightweight Roof“ were installed at the end of 2013, the building featured a complete “green shroud“. Object: Parliament of the German Speaking Community in Eupen, Belgium. The area of the German Speaking Community covers barely 854 km² German is the official language, used in schools and courts. The inhabitants of this area consider themselves people of a European core region with access to four different countries (B, D, NL and L). According to the Treaty of Versailles the area of Eupen-Malmedy was conceded to Belgium in 1919. As a consequence 70.000 Germans became Belgians. The German speaking minority benefits from home-rule in Belgium and since 1984 have their own parliament. This parliament represents the people of the smallest Belgian Federated State and has 25 representatives. The German Speaking Community arranges partnerships with European regions and states, ratifies international agreements, is active in the transnational Maas-Rhein Euro Region and in the Greater Region. They are also represented in the European Parliament. Photo 2: View from the completely greened new building in the park. Photo 3: Greened building successfully embedded between park and main building. Photo 4: Interesting contrast between stone and greenery. Photo 5b: … and half a year later. Photo 6a: Details of the transition between roof and walls during the construction phase …Photo 6b: … and once the construction phase is over: you can barely see the transition between roof and walls.